When it gets to retro metal it always impresses me how some guys can resurrect the spirit of an era, even though their date of birth comes years later. It must then take a lot of dedication and studying to be able to sound authentic. Swedish boys (and a girl, since Susanna Salminen plays bass for this band) Katana not only play classic heavy metal in their debut Heads Will Roll, but also look the part in their striped and leopard spotted tight spandex pants. Pulling the outfits on would have been an easy gimmick, but Katana is certainly not all about the clothes (even if some may find the look a bit ridiculous). 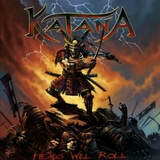 Avoiding the trappings of modern overproduced double bass propelled power metal, Katana steers close to metal played in the early 80s, with healthy helpings of Europe-styled hard rock and even some sprinklings of glam. Even though Iron Maiden gallop can be prominently heard in a few places (Blade of Katana), the band is not all about NWOBHM noodling. If anything, the likes of Picture and White Lion are closer references to rebel rousing feel-good radio rockers like the opener Livin’ Without Fear, Heart of Tokyo and Rebel Ride. The dudes of Katana constantly push the melody above the not-so-busy riffs and bribe you out with straightforward almost high school enthusiasm (Neverending World). The double guitar leads are flying around like zipping bullets and melodies culminate in the choruses loaded with bona fide radio hit hooks, if you lived 30 years ago (Phoenix on Fire). Most of the time Katana is about playfulness (Across the Stars), driving around, windows down, and having a good time, but the closer Quest for Hades shows more progressive, involved and narrative side of the band. At the same time, given the band’s investment in more polished production than warranted by the style, one gets a feeling that a certain seed of commercialism is not a foreign feeling for Katana. You would not confuse Heads Will Roll with the stuff dug up and released by Shadow Kingdom Records, like Crisis, Japanese Genocide, Ritual and Wolfbane. Speaking of Japanese theme, it is obvious that Katana are fans, with multiple Asian references in their song titles and the lyrics, katana itself meaning ‘backsword’ in Japanese. Vocals with this style of metal is an important component, you can’t growl something unintelligible here, and Johan Bernspang tries hard. Mostly staying in the mid-Hammerfallian range similar to Joacim Cans, Johan pushes himself on occasion (Blade of Katana, Rebel Ride), and occasionally emulates Bruce Dickinson phrasing style (Blade of Katana). A little less than 30 years ago my high school crowd became split on what metal we liked better. I fell to the heavier side with Judas Priest and Black Sabbath, but there were many of my friends who maintained much stronger bonds with more rock-oriented bands like Rainbow and Queen. I hope those guys are still with it and could smile at the likes of Katana, seeing how their passion keeps on reverberating. It is hard to call Katana original (they are specifically not about originality), and they may not even be the best retro band around, yet the fervor and likeability of Heads Will Roll is undeniable.